End of the road: Team Sky cyclists. THE future of Team Sky is in doubt after their principal backer announced it would end its ownership and sponsorship at the end of 2019. Team Sky have been among the most successful teams in cycling over their nine-year history to date, winning 322 races, including eight Grand Tours. 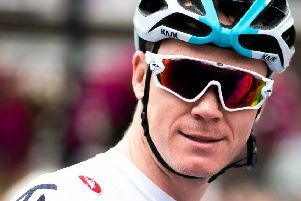 They delivered the first British winner of the Tour de France in Sir Bradley Wiggins in 2012 and have gone on to win six of the last seven editions. But Sky have now announced it would walk away next year, with the decision coming in the wake of a £30bn takeover by US cable TV company Comcast earlier this year. Team Sky had appeared confident that takeover would have little impact on them, and in recent months handed new long-term contracts to Tour de France winner Geraint Thomas and 21-year-old emerging talent Egan Bernal. It is understood that Sky’s decision came as a shock to Team Sky principal Sir Dave Brailsford, with staff and riders told during a training camp in Mallorca. In a statement, Brailsford indicated the team would look for new partners. “While Sky will be moving on at the end of next year, the team is open minded about the future and the potential of working with a new partner, should the right opportunity present itself,” said Brailsford. “For now, I would like to thank all Team Sky riders and staff, past and present - and above all the fans who have supported us on this adventure. Wholesale changes of sponsorship and backing are common in road cycling, and Sky’s 10-year association is a long one by comparison to most. But the likelihood of the team finding backers with the same deep pockets of Sky, who made them the best funded in the sport, seems slim given the struggle other successful teams like Quick-Step Floors and BMC Racing have faced when seeking new sponsors of their own. Team Sky’s budget was estimated to be around £37m last season. Sky had also sponsored British Cycling, but ended a partnership which began in 2008 at the end of 2016. Team Sky was launched in 2010 with the goal of winning the Tour de France with a British rider within five years. Sky quickly delivered with Wiggins’s 2012 success before Chris Froome took over, winning the first of his four Tour titles in 2013. Froome’s Giro d’Italia win earlier this year made him the first rider in more than 30 years to hold all three Grand Tour winners’ jerseys at the same time. In the summer Geraint Thomas became the third Team Sky rider - as well as the third Briton - to win the Tour de France, the team’s sixth success at the race in seven years. However, the team have faced plenty of controversy of their own. The UK Anti-Doping Agency conducted a 14-month investigation into a ‘mystery package’ delivered to then-team doctor Richard Freeman on the final day of the Criterium du Dauphine - won by Wiggins - in 2011. A Parliamentary committee which held hearings into the case found the team had crossed an ‘ethical line’ by using the powerful corticosteroid triamcinolone to prepare for major races. The substance is banned in competition but legal out of it. Wiggins denied that any drug had been used without medical need and hit out at the process, saying it was “so sad that accusations can be made, where people can be accused of things they have never done which are then regarded as facts”. Team Sky also have plenty of detractors within cycling for tactics which many believe stifle racing. Their superior budget has allowed them to employ riders who would be leaders elsewhere in a support capacity and effectively shut down attacks in the biggest races, something which has proved unpopular with many, particularly at the Tour de France. It is understood Sky’s decision is not related to the controversies, which have followed the team for more than two years, but instead follows a review of its wider partnerships.